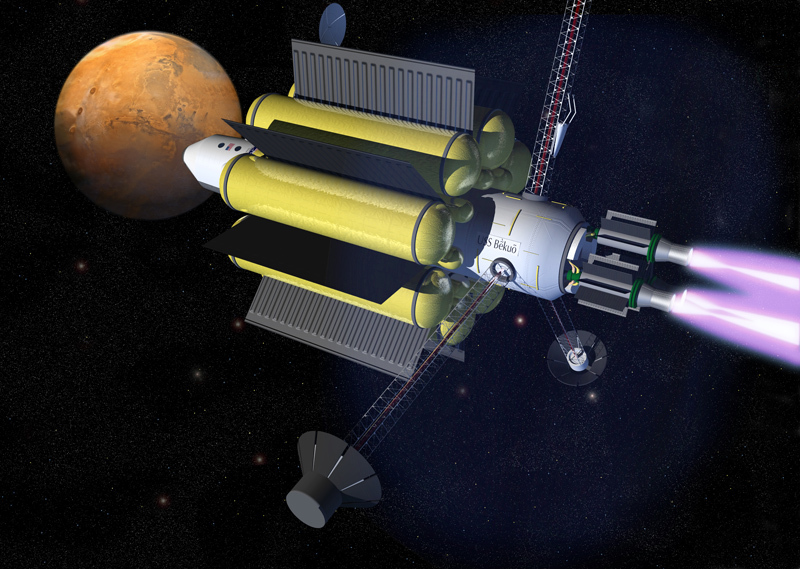 VASIMR plasma engine: Earth to Mars in 39 days? In Arthur C. Clarke’s classic science fiction novels and movies 2001: A Space Odyssey and 2010: Odyssey Two, the spaceships Discovery and Alexei Leonov make interplanetary journeys using plasma drives. Nuclear reactors heat hydrogen or ammonia to a plasma state that’s energetic enough to provide thrust. In 1983, seven-time Space Shuttle Astronaut Franklin Chang Diaz turned Clarke’s speculations into reality with an engine known as the Variable Specific Impulse Magnetoplasma Rocket (VASIMR). An electric power source ionizes hydrogen, deuterium, or helium fuel into a plasma by stripping away electrons. Magnetic fields then direct the charged gas in the proper direction to provide thrust. Chang Diaz has pointed out that hydrogen would be an advantageous fuel for the VASIMR engine because the spacecraft would not have to lift off carrying all the fuel it needs for the journey. “We’re likely to find hydrogen pretty much anywhere we go in the Solar System,” he said. A spacecraft using conventional chemical rockets would take eight months to get to Mars during opposition. However, the VASIMR engine would make the journey in as little as 39 days. 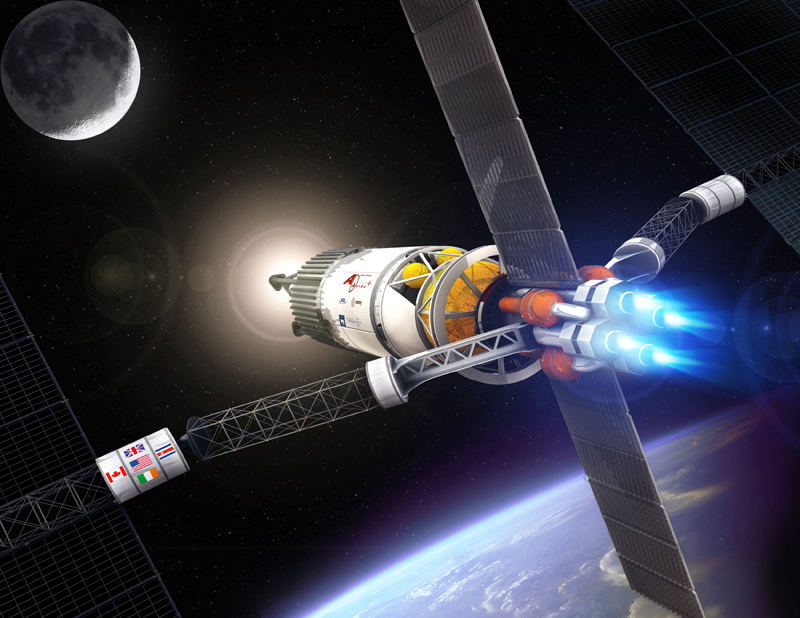 The use of nuclear power in space is not without its controversy. In 1997, there was widespread public concern when NASA’s Cassini probe, which carried a plutonium battery, made a flyby of Earth to perform a gravity assist. Although NASA denied that the risk to the public, should an accident occur, was no greater than that posed every day by other sources of radiation, some scientists, including the popular theoretical physicist Michio Kaku, disagreed. In April 1970, the Atomic Energy Commission was deeply concerned about the return of Apollo 13 to Earth. Where an Apollo mission would usually leave the lunar module’s descent stage on the Moon, the unsuccessful Apollo 13 dropped its lunar module Aquarius, with its plutonium-powered scientific experiments, into the ocean, raising concerns about radioactive contamination. Elon Musk, CEO of Space Exploration Technologies Corporation (SpaceX), is skeptical about the viability of the VASIMR engine. One reason is the concern about radioactive debris falling to Earth in the event of an accident. Musk is also skeptical that the VASIMR engine would be a significant improvement over chemical rockets, stating: “So people like Franklin – basically it’s a very interesting ion engine he’s got there, but it requires a big nuclear reactor. The ion engine is going to help a little bit, but not a lot in the absence of a big nuclear reactor.” Musk also points out that the big nuclear reactor would add a lot of weight to a rocket. Another vocal critic of the VASIMR engine is Robert Zubrin, president of The Mars Society, who designed the Mars Direct plan to colonize Mars and wrote the popular book The Case For Mars. He has gone as far as to call the VASIMR engine a “hoax”. In other words, Chang Diaz is allowing for further developments that would enable such a reactor. 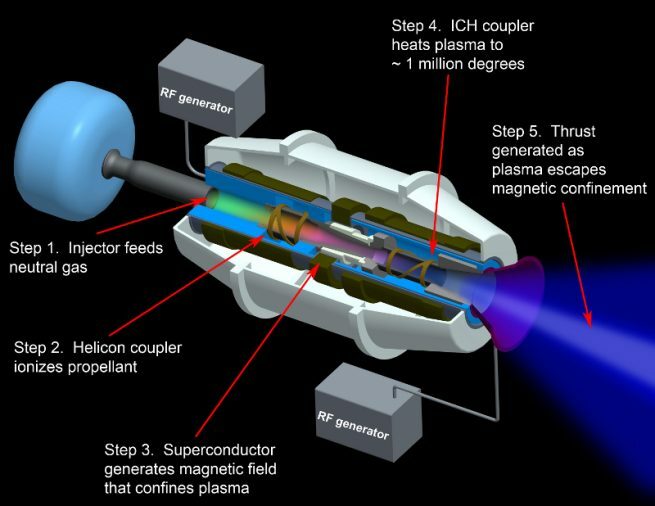 The 2011 NASA research paper “Multi-MW Closed Cycle MHD Nuclear Space Power Via Nonequilibrium He/Xe Working Plasma” by Ron J. Litchford and Nobuhiro Harada, indicates that such developments are feasible in the near future. Whether the VASIMR engine is viable or not, in 2015, NASA awarded Chang Diaz’s firm – Ad Astra Rocket Company™ – a three-year, $9 million contract. Up to now, the VASIMR engine has fired at fifty kilowatts for one minute – still a long way from Chang Diaz’s goal of 200 megawatts. In its current form, the VASIMR engine uses argon for fuel. The first stage of the rocket heats the argon to plasma and injects it into the booster. There, a radio frequency excites the ions in a process called ion cyclotron resonance heating. As they pick up energy, they are spun into a stream of superheated plasma and accelerated out the back of the rocket. I wonder if they’ll ever get the full 200 MegaWatt engine into space. There too many paranoid anti-nuclear folks out there who may act out and block it. How is this fundamentally different from low-thrust ion engines and why does this theoretically have so much more thrust? Current ion engines use an electric field to accelerate the ions, but don’t contain the ions in a magnetic field. There’s a screen at the exit of the thruster that the ions race by, and there has to be a balance between the ions’ energy and the decay of that screen. By constricting the flow with a magnetic field, there’s no contact with anything physical, and the ions’ energy can be cranked way up increasing thrust. That said, the amount of energy required is still very high, and the arguments about large nuclear reactors being required are still valid. The VASIMR engine is a legitimate propulsion device with excellent high power (>200 kW) performance that out performs ion and hall engines in that power regime. The issue has always been the power source. Solar is up and coming and nuclear like it or not is required to explore the solar system. There’s actually very little risk with nuclear with the exception of political risk. Until you turn on a fission reactor it hasn’t built up any nuclear waste. It is simple, don’t turn on the reactor until you are far away from Earth. Such technology is required for human missions. Please read more closely – the call is for 200MW or 200,000kW. The dimensions called for would be at least 50 years away in needed research, advancements Chang-Diaz is assuming, and development cycles. Will be great in 2068. By 2068 we would have known the Vulkans for 5 years already! To generate 200 kWe, it would need >1000 sq m of PV panels at Earth, twice that at Mars. Half a football field. 1000 sq m is a gross underestimate. The average yield of a solar panel is about 300w /sq m. It would take an area of a square 800m wide to produce 200Mw at Earth! Hello. I am doing a science project and I am in charge of fuel going to mars. Does anybody have anything that could help me with this? Doable with solar concentrators: mirrors with large collecting area that focus down the light to smaller area solar cells. Reflecting surfaces (in space) are light, solar cells are heavy. If I understood this correctly, the exhaust doesn’t make contact with any surfaces. Wouldn’t that mean a long life cycle at relatively high thrust levels compared to other ion thrusters? That to me is the greatest benefit and well worth the investment which is tiny. A VASIMR powered drone could spend years clearing up the mess we’ve made in orbit or be used as a cargo hauler between Earth and the Moon. For this use, I’m guessing you could probably get away with 200-300kw of solar power (recent NASA sponsired solar panel research suggests this is coming in the not too distant future) so the nuclear reactor issue is really just icing on the cake. If it becomes possible then great, if not there’ll still be plenty of useful applications for a functional VASIMR system at the targeted (by NASA) power levels that are better suited to this technology than other ion thrusters. Also by 2068 we may very well have fusion reactors to do this which could be much smaller than their fission counterparts and won’t have the same worldwide objections. Another use for the VASIMR that I didn’t consider before is as propulsion for asteroid mining vehicles/mineral transporters. In terms of our presence beyond LEO, this is probably one of the most important potential ventures. Extracting and refining raw materials in space would produce the basis for an orbital construction infrastructure. Something like this ensures continued presence, not just expensive one off shots in the dark. VASIMR could potentially do this way better than rockets can (fuel efficiency) and it looks to have greater thrust capabilities than traditional ion technology. I have no doubt that it’s not perfect but suggesting this technology should get us directly to Mars and if it doesn’t it’s basically not an improvement or the people making it are lying to get cash is not really the way to go in my opinion. Much as I tend to agree with Zubrin, I also recognize that he can a mite prickly on any topic which smacks of interposing sizable technological or programmatic obstacles in the path toward speedy Mars missions. I can see how he would balk at the idea of inventing a whole new drive system to get there, as it could be another show-stopping delay. Same might go for Musk. Still, the advantages of such a drive system in terms of ISp and thus of time/payload improvements can’t be brushed off. As for power, a LFTR system could be significantly smaller (and thus more feasible) than even a highly advanced, miniaturized HPLWR type system. LFTRs are also meltdown-proof and require less refined fuel (and produce fewer trans-uranic isotopes as ‘waste’). This bears looking at, IMHO. From what I’ve read across several websites, including Dr. Diaz’s, it seems the people that are the most critical either have an economic stake to lose or are just a wet blanket in general. The developer is a physics PhD and former shuttle astronaut. I would bet he has some idea what he’s talking about. The plasma, ions and everything else, provide the thrust not just the ion stream. A molten salt nuclear system could provide the power level he’s talking about. Electric thrust and nuclear power is the the gateway to any significant, enduring human exploration and functioning off of our big blue marble. Does anyone else see the parallels with previous exploration? It’s dangerous, expensive and the majority of the existing population think it’s crazy. Human history is filled with exploring new territory and the pattern is very similar. Elon M. challenged the system and is kicking it in the teeth after everyone said “…it’ll never work, that’s not how we’ve done it before.”. Dr. Diaz is doing a similar thing and the folks that can’t see past the end of their nose or have money too lose don’t want a new player. NASA has checked this out and established milestones. Dr Diaz is meeting them. It works. Solar systems require mind numbing areas of panels to generate hundred MW levels of consistent power anywhere past earth. Doable but not practical for an electric thrust system. Solar is much better suited for static life support. A concentrating solar thermal storage system outside the atmosphere would be very effective for static life support by supplying not just electric power but a stable heat source as well. Personally, I’d love to see Dr. Diaz system succeed. WHo cares if it is 39 or 40 or 37 or 50 days. If it shortens the trip and does anywhere near what is claimed then its a win-win. Chemical rockets need too much fuel and ion and Hall thrusters don’t have enough thrust to get it done in a short time. Maybe if they combined both in it could be doable. Chemical rockets to overcome inertia with a good kick and electric (clustered Hall thrusters) to get the speed up to effective levels. And once again we are back to the power issue. To get enough power for a big enough cluster of Hall or ion types we still need nuclear. Ion, Hall, VASIMR…whatever. Let’s quit crying about who is better and root for someone to get it done. Fastest one to Mars wins. Go! The VASIMR engine is closer than you think, it uses an RF generator, so does the plasma conversion unit, the propellant is ionised the use gasses, I use water, yes water has hydrogen and oxygen, this is ionised into the plasma as you see in the picture of the plasma conversion unit, it has a force output of 3tons per sq inch. I do not generate a magnetic field to do the ionisation. So you see it is not that different, but it would be difficult carrying water around in space, or would it modern rockets carry lots of fuel, so do planes. Sounds like Robert Heinlein’s torch ships. Só estão mostrando o que querem que vejamos. Essa tecnologia já é passado!